The Welsh Government says it will work to discourage businesses from using "non-ethical" palm oil in their products and manufacturing processes. Economy Secretary Ken Skates has said he wants to follow the lead of Greenpeace and supermarket firm Iceland. Mr Skates wants to take a stand against palm oil from unsustainable sources. The oil has been linked to deforestation and climate change. He paid tribute to the organisations for raising awareness of the "devastation and destruction" caused. Changes will be made to the Welsh Government's Economic Contract - a key component of its Economic Action Plan - that requires businesses seeking support to enter into an agreement with the government designed to drive responsible business behaviours. It is said palm oil production has been responsible for around 8% of the world's deforestation between 1990 and 2008. However, supporters of the product say it uses less land for cultivation than alternative oils. It is also reported that oil palm trees do not require as many pesticides or fertilisers to be used when growing them. Mr Skates said: "The campaign against the use of non-ethical palm oil is very much in line with the ethos of my Economic Action Plan which has driving sustainable growth and encouraging responsible business behaviours at its very core. "The Economic Contract is an obvious vehicle through which we can influence business behaviour and encourage responsible action. "With that in mind I want to use the Economic Contract to encourage and assist companies to move away from the use of non-ethical palm oil to help reduce the use of this damaging and destructive product." The Welsh Government said it was also considering how it can reduce the use of palm oil in food and drink produced in Wales. 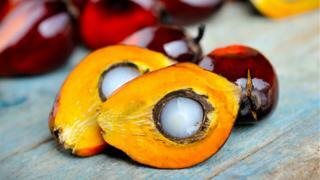 What is palm oil and why is thought to be bad?